Below, you'll find the photos I took of the various state signs I encountered as I headed east to see Carole in August. The other identifying feature of a state is their rest stops. Often one of the first things to close in a cash strapped state, how these are built and maintained says a lot about how the state views the people traveling through. At 9:00 a.m., on the 15th, I stopped to stretch and use the facilities at a rest stop off I-65 as I headed to Indianapolis. Compared to other rest stops, there is a huge amount of grass here. Picnic facilities are off the screen to the left but that consisted of 3 picnic tables and a garbage container. 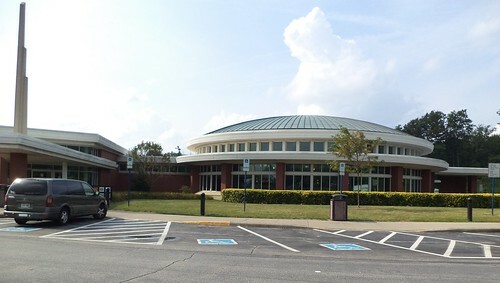 The circular building is where the vending machines are. 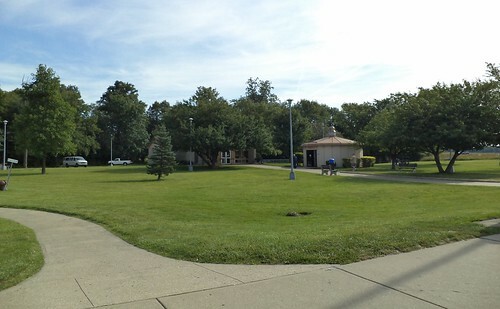 The actual restrooms are in the left center, behind the trees. There was a giant "you are here" map inside, brochures of attractions in Indiana and men's and women's lavatories. Utilitarian. Truck parking is behind me. As spartan as this is, I actually appreciated having a ways to walk. I needed to get out and stretch. Perhaps that is one of the reasons for this design. The walk clears your head and makes you less of a drowsy driver. 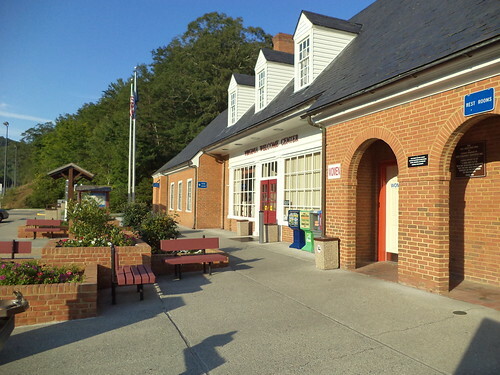 This is the rest stop in Virginia. I got here at 6:30 p.m. on Thursday, August 15th. It's tucked into the side of a hill. You can see lots of benches to sit down, newspaper vending machines and the men's and women's lavatories on either side of the main building in white. There were three maps outside with "you are here" markers. The center section had maps, brochures and a small shop, closed at this time, that sold souvenirs. There were vending machines in this area. There was a large picnic area off to the right, a dog run off the opposite end of the building and flowers everywhere. I think I like this place the best. 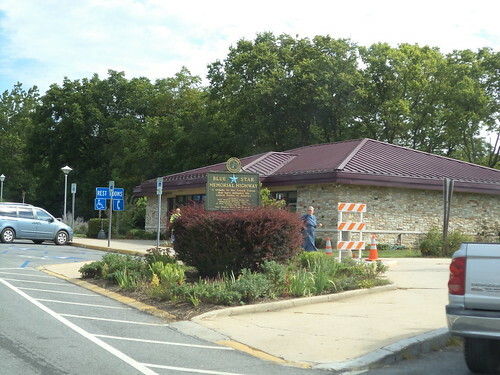 On Thursday, August 22nd, when I headed home, I stopped at a West Virginia rest stop located on north Interstate 81. Everything was contained in this building, from lavatories to travel information to a small selection of vending machines. There were picnic areas on either side of the building with a dog run way off the to right. The landscaping was nice but didn't have as many flowers as the Virginia stop did. I have always liked the Ohio travel plazas off Interstate 80. They are huge, as rest stops go. Three vendors selling food are in the circular room, with ample seating for several school busses full of kids on their way home from a band contest. There is a nice convenience store and a small game room. There were two TVs, one showing news, the other showing the weather. That was important because I knew I was driving into rain and I wanted to know where it was. This is a pleasant place to stop and take a break. You contrast this with the last place I stopped, mainly to get gas, although I did get a Coke for the rest of the drive home. This is the last service plaza west on the Indiana Toll Road. It's a low building with a large sign advertising McDonald's on the front. There is a lot of seating to the left with a couple of large screen TVs with CNN and the Weather Channel on them. McDonalds is to the right as you walk in. You have to be of a certain age to remember Howard Johnson's along the main highways as you traveled. They contained a restaurant, bathrooms, gas pumps and one of the largest souvenir stores you'd see on your travels. If you wanted any kind of souvenir about Indiana, you could find it at the store attached to these rest stops. They weren't attached to the Interstate themselves. You had to drive off the road to find them, but you didn't have to go far. Howard Johnson's distinctive blue roof made it easy to spot. Now, we have McDonalds. We know they pay a licensing fee to be in these places. Probably a portion of the revenue generated goes to the state where they are located. I like Ohio's rest stops for the variety in who offers food. If you are hungry or in need of gas, Ohio and Indiana on the toll road have you covered. For just a rest, Virginia's stop was the best. I guess it's a matter of what the state thinks needs to be provided the traveling public. The toll roads have limited on and off ramps so there is a need to provide more than just a potty and a pop machine. 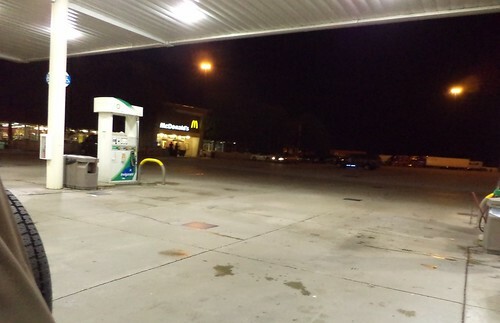 The other places were between exits where food and gas can be procured. Each works for its location.Virginia and Ohio made me want to stop and rest. That is, I think, the main point of these places. Provide the traveler a place to just be. Let them recharge their batteries. A rested driver is happy driver.